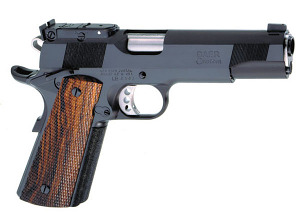 Designed specifically for the NRA Police Pistol Combat Matches, this full size government model 1911 includes all the features of the Premier II, but with a substituted PPC rear sight. Features include Baer made NM steel frame, slide and barrel, a fitted stainless steel barrel bushing, extended ejector, a crisp 4 lb. trigger pull, beveled magazine well, ambidextrous safety, checkered cocobolo grips and a beautiful blued finish. 9mm model features a supported chamber.